The Association of Mediterranean Deltas DELTAMED is a non-profit legal personality driven by the “Instituto Agroambiental de les Terres de l’Ebre” and “the Comunidad General de Regantes del Canal de la Derecha del Ebro”, in which the are integrated Po’s Delta (Italy), Evros (Greece), Danube (Romania), Nile (Egypt), Ebro’ and the Albufera of Valencia (Spain). Also attached are members of the Laguna Hue (Vietnam) and the Faculty of Architecture, Design and Urbanism of Buenos Aires (Argentina). The main objective of DELTAMED is to be actively involved in the process of the public authority’s decision on issues that may affect the future of agri¬culture development in these deltaic landscapes. Thus, DELTAMED focuses its efforts on getting for the Deltas and wet areas integrated, a sustainable development to ensure the performance of the agriculture and a respect to the environment. The Mediterranean Deltas are strategic enclaves, they have very fertile lands, suitable for agricultural production, particularly rice. They need sufficient water resources To achieve it. They are also the ideal settlement for the fishing and tourism development. In addition they have a great environmental wealth and they constitute a suitable framework for the development of high biodiversity. These Deltas have a variety of features, but they also have a common problem regar¬ding: resource management and water quality, flooding, coastal regression, salinization and wedge saline, the subsidence, the implementation of an environmental agriculture, the protection of its wetlands, lagoons and bays, the environmental conservation and the sustainable development of deltaic areas. To all of them it has been recently added the impact in the climate change because they are areas very vulnerable to the rising sea level. 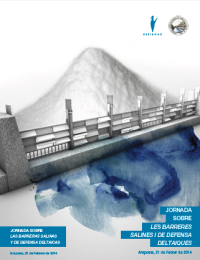 For all exposed the “Comunidad de Regantes de la Margen Derecha del Delta del Ebro and DELTAMED”, have thought necessary to organize a conference about the Saline Barriers and deltaic defense in which it will be discussed the saline. In the conference it will analyze and discuss the problem in the Deltas, plus saline intrusion phenomena and the proposal of various actions of anti-salt barriers. It will be also described the impact of sea level rise, and the mitigation through various solutions, among which it highlight the barriers of defense. Finally, it will present the project MOSE, project for the protection of the lagoon of Venice, one of the most important activities that is being built in the Mediterranean.